Although he made it to the silver screen twice in the 1960s, there’s a much longer list of Doctor Who movie scripts, projects, and beermat proposals that never saw the light of day. From Doctor Who and the Krikkitmen by Douglas Adams, which was eventually reworked into the third HitchHikers book, through The Last of The Timelords by Johnny Byrne, to the more recent announcement by David Yates that he would be directing a new Who movie (although he forgot to tell anyone at the BBC about it), every fresh film project has been doomed to failure over the last 50 years. 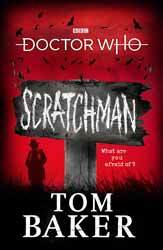 But perhaps the most intriguing proposal of them all was Doctor Who Meets Scratchman. An idea cooked up in the 1970s by Tom Baker and then co-star Ian Marter over boozy afternoon pinball sessions in Soho, one of the main reasons it attracted such mythical status over the next few decades is that so little was really known about it. I can vividly remember Doctor Who Magazine promising to run an in-depth article on the abandoned project way back in 1984, but it ultimately took 23 years for that article to finally see print in 2007. The film may or may not have been about zombie scarecrows. It might have featured Twiggy, along with Vincent Price playing the Devil. The Daleks and Cybermen may have made an appearance. The climax of the film might have seen the main characters fighting for their lives whilst trapped in a giant pinball machine. Despite initial lukewarm encouragement from the BBC, the project dragged on for several years with no progress on funding. Baker found himself in hot water when he thought it would be a good idea to suggest in a newspaper interview that young Doctor Who fans should each send him £5 to help get the movie off the ground. As the hard-earned paper-round money started flooding in, the BBC washed their hands of the project, Baker was forced to return all the money, and it seemed that Doctor Who was never destined to meet Scratchman. Fast-forward about 40 years, and If you’d have asked me to name my dream Doctor Who book, I’m not sure I could have topped the idea of Baker finally breathing life into his and the late Marter’s abandoned Scratchman project. Following the relatively recent discovery of one of the original scripts, that’s exactly what we’ve got in 2019. So was it worth the wait? Although it’s Baker’s name that appears in big bold letters on the front cover, turning to the title page reveals that this work was written in collaboration with veteran Who book and audio writer James Goss. A cynic might ponder just how much input the star name Baker had into this book, but I suspect it’s very substantial and that long-term fan Goss was largely on hand to help with continuity and minor editing. Readers of Baker’s previous works (autobiography Who On Earth is Tom Baker? and Roald Dahl-esque children’s novel The Boy Who Kicked Pigs) should be able to recognise the same deliciously dark humour within these pages. The first surprising thing you’ll notice about the book is that it’s written in a first-person narrative from the Doctor’s perspective which some fans may regard as bordering on sacrilegious. There may have been a risk of diluting the mystery of the central character here by spending every page inside the Doctor’s head, although not too many of the Doctor’s inner thoughts are given away. In fact, it probably would have worked just as well in a third-person narrative, which would also have removed the need for half-hearted explanations as to how the Doctor could be describing scenes at which he’s not even present. The whole book is framed by an outer story set in a courtroom on Gallifrey in which the Doctor is defending his meddling activities to the Time Lords by recounting the events of Scratchman in a bid to keep his freedom. Yes, we’ve been here before, and this evokes memories of The Trial of a Timelord, but I’m sure Baker has led far too much of an interesting life to have any familiarity with that 14-episode circus of disaster. It’s a short and snappy device which works very well in splicing up the main action here, and runs on a deeper and more rewarding level than The Trial of a Timelord’s set-up of essentially just having two characters exchanging increasingly absurd insults with each other. The first half of the book is clearly a love letter to the Philip Hinchcliffe era of the TV show, though it perhaps dares to take a step beyond the acceptable boundaries of the time with the inclusion of undead vicars on fire and killer scarecrows ripping up gravestones to batter down church doors. It’s a very simple tale told in a very simple style, but it’s an utterly engaging read with welcome comical touches to counterbalance the grim horror. We also get a chance to venture beyond the TARDIS console room and see Baker’s playful vision of the deeper corridors of his time machine through the eyes of an imperilled Sarah-Jane Smith. However, the second half of the book is by far the superior as Baker throws tradition out of the window and takes us on an outlandish journey into the Doctor’s worst nightmares. Taking inspiration from Alice in Wonderland, Douglas Adams, and Dante’s Inferno, it’s an exhilarating and brilliantly funny voyage into insanity with a few very familiar villainous faces for company. Most surprisingly of all from the actor who never seemed to relish the idea of sharing the stage with other Doctors, we even see a few welcome glimpses of past and future incarnations, leading ultimately to an Epilogue which will have some fans jumping for joy and others muttering grumpy thoughts aloud. And yes, there might just be a giant pinball table thrown into the mix. The difference in styles between the two halves makes for something of a disjointed book and would probably have made for an equally disjointed movie. It wouldn’t really have worked as a TV serial back in the day either, with not enough going on in the first half, and way too much going on in the latter. I feel as if Baker may have been trying to show us that he can do both traditional and far-out, but as much as I enjoyed the slow-building first half, I think I would have preferred more space devoted to the weird and wonderful journey through Scratchman’s lair. However, this is still one of the funniest, most unusual and most fascinating Doctor Who books you’re likely to pick up this century. Baker claims that Scratchman will be his last book. If that’s true, Baker has left us with a worthy and thrilling swansong which finally opens the lid on an encounter that we’ve waited forty years to enjoy.